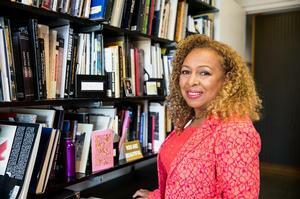 Art historian and curator Kellie Jones and bead artist Joyce J. Scott are among the 2016 MacArthur award recipients announced by the Foundation on September 21, 2016. Each MacArthur "fellow" (as they're called) receives a "stipend" (as it's humbly called) of $625,000 to expend in whatever way they please. 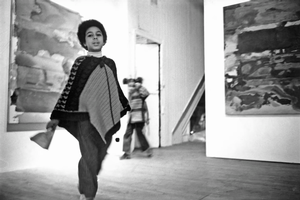 Kellie Jones and Joyce J. Scott join a number of other African American visual artists and visual arts professionals who have won the award — painters Kerry James Marshall and Mark Bradford, installation artists Kara Walker and Fred Wilson, photographers Ruby LaToya Frazier, Carrie Mae Weems and Deborah Willis (who also is a photo historian), South Carolina sweetgrass basket maker Mary Jackson and Rick Lowe, director of Houston’s Project Row Houses (restored shotgun houses which serve as studios for visiting artists, art exhibition spaces and homes for single mothers). 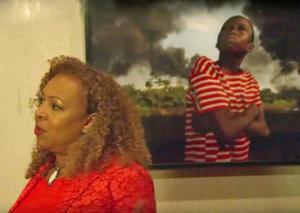 In her MacArthur video profile, Kellie Jones said “Unappreciated artists are always there. We just have to find them. The goal of my work is to expand what we understand modern and contemporary art to be." In 2011, the print IRAAA reviewed Jones book, Eyeminded. The review provides a good overview of Jones’ life and work and is reprinted below. “I went beyond pleasing myself and opened a door to some place else,” says Joyce J. Scott in her MacArthur video profile. Joyce J. Scott refers to her self as a “round the way girl.” Despite international recognition for her beautiful, fearlessly edgy art, she’s that girl down the street who maintains a deep affinity for her city. She’s lived in Baltimore, Maryland her entire life. When Freddie Grey was murdered, she was at her row house home down the street from the CVS that was set on fire. Read the full IRAAA+ article on Joyce J. Scott, "Round the Way Girl and Her Worldly Ways," here. 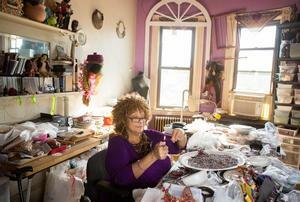 Kellie Jones has had a fascinating life in art. This collection of essays offers vivid glimpses into the childhood and professional experience of this noted art history and curator. It includes writings by her as well as writings by her celebrated family members — Amiri Baraka, her father; Hettie Jones, her mother; Lisa Jones, her sister; and Guthrie P. Ramsey, Jr. , her husband. I have never seen a book quite like it, certainly not in the field of African American art criticism and history. But the story of Kellie Jones and her colorful, accomplished family is worthy of such a singular treatment. “Look it up,” she (Kellie) said, and of course I did before calling he back. Other priceless jewels include a 1968 interview with conceptual artist David Hammons in which he flatly states, “I can’t stand art actually. I’ve never, ever liked art, ever.” He goes on to explain in extended detail how such thinking could be consistent with a lifetime of art making. I’ve got a feeling that not too many other people besides Kellie Jones could have actually reeled in such an interview and accompanied it to the page. Jones, herself, is such a surprising, intellectual phenome, so impressive in her single-minded pursuit of hight ground for African American visual artists that one can pretty much count on the fact that anything she lays her hand to is going to be worth reading. As the contents of the book demonstrate, her penetrating focus has encompassed the work of sculptor Martin Puryear (the object of the title essay of the book), photographers Dawoud Bey, Lorna Simpson and Pat Ward Williams, and painters Jean-Michel Basquiat and Norman Lewis. I was very pleased to see that the book includes a particularly substantial treatment of abstract artists such as Howardina Pindell, Al Loving, William T. Williams, Sam Gilliam and AlmaThomas via her curatorial essay introducing the Energy/Experimentation: Black Artist and Abstraction, 1964-1980 exhibition at the Studio Museum in Harlem 1984 and It’s Not Enough to Say "Black is beautiful": Abstraction at the Whitney, 1969-1974, which was first published in Kobena Mercer’s Discrepant Abstraction in 2006. Jones’ focus so far has been mostly on artists who range from mid-career to elderly to deceased so that the reader may come away wondering what her eyemind might make of the young African American artists currently attracting critical attention. Eyeminded: Living and Writing Contemporary Art offers a series of unremitting delights and surprises. It is a big and unusual book and I worry that, for this reason, it won’t be reviewed as much as it should be. I have a feeling I will be drawing from this book in my own writings for a long time because of my ongoing fascination with the aesthetic variations among African American artists of the past and present, from abstractionists, conceptualists, painters, sculptors and quilters to neo-Africanists and neo-realists and the like. Everything Kellie Jones and her brilliant family have to say on art and life is both welcome and stimulating. Michele Wallace, Ph.D., professor of English, Women’s Studies and Film Studies at the City College of New York and the CUNY Graduate Center. Related in the IRAAA+: "The Struggles Away or Towards This Peace," an article on Amiri Baraka’s drawings. The writer also was a prolific visual artist.